How do I Clear my Sitemap's Cache? 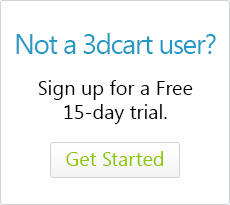 3dcart offers our customers a sitemap that we regenerate for your store on a daily basis. When we regenerate the sitemap it will then include all changes and updates you have made within the previous 24-hour period. Often times you may like to manually regenerate your sitemap more often than this timeframe. In order to manually regenerate the sitemap you first need to delete the cache file that keeps the sitemap unchanged between the times that we regenerate it. Once this is done you can browse to the sitemap file, this will force the sitemap to re-index your site and regenerate with all the new information you have added since it was last generated by us. Go to the "Sitemap" section. Your sitemap is now updated. You can also do this same action via FTP. This article will assume you already have a basic understanding of connecting to your store's FTP. If not, please review our FTP articles located by clicking here, here and here. Locate and select the file "sitemap_1.xml"
Once sitemap_1.xml is deleted you are done with FTP and may close your FTP program. Once the site map cache file has been deleted you simply need to browse to your sitemap. To access your sitemap, open up a browser window and navigate to http://[store-URL]/sitemap.asp where store-URL is your 3dcart store's domain name. Once you have accessed your sitemap, the sytem will re-index your site add all new content as needed and recreate the cache file. Your sitemap has now been regenerated.